TVS bikes always come loaded with very impressive features at an affordable price tag. This Indian two-wheeler giant has launched its new 110cc automatic scooter TVS Jupiter. The best with this two-wheeler is that the company launched it with a very less price. The TVS Jupiter price is Rs.44,200 (Ex-Showroom, New Delhi). 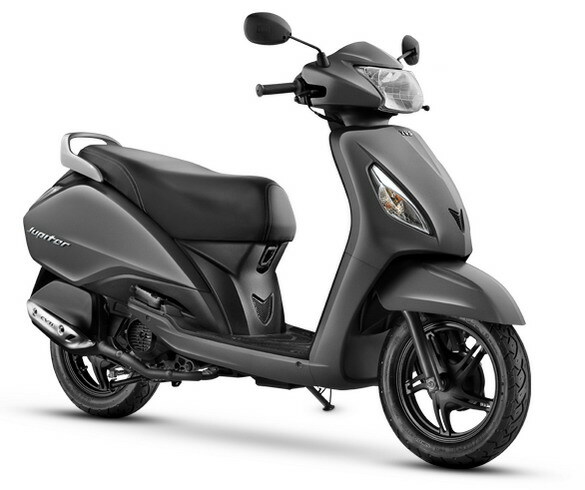 This new model is based on Wego's platform, aiming at the Indian male scooter buyer. It provides a very impressive mileage. It has the engine which produces more power without compromising on fuel-efficiency by increasing the compression ratio and reducing the friction between the moving parts. The durability is maintained by the use of moly coated pistons. The TVS Jupiter features show that it is powered by a very powerful and frugal engine. This 110cc four-stroke, single-cylinder engine, loaded with an air-cooled technology. This engine cranks off a power output of about 8bhp which arrives at an acceleration point of 7500 revolutions per minute. It can produce a maximum torque of about 8Nm which arrives at an acceleration point of 5500 revolutions per minute. It has both kick start and self start facility that gives ease of starting and better riding experience. It has a fuel-tank with the capacity of 5.3 litres. It is provided with a 130mm drum brakes on its both rear and front side. The suspension system loaded with this vehicle has a telescopic suspension at the front side while the rear side has a hydraulic and gas filled suspension. The company claims for the fuel economy of 67km per litre. It has a large under storage space of 17 litres which can swallow a helmet easily. The dimension of this two wheeler is same as its sibling Wego. The large length and long wheelbase helps with seating and storage space. TVS Jupiter pictures show that it has a stylish and decent look. The overall dimension of this scooter has the length of 1834mm, width of 650mm and the height is of 1115mm. The ground clearance of this model is 150mm and it has the wheelbase of the height 1275mm. This larger wheelbase provides better stability even on wet and slippery surfaces. It is a smart looking two wheeler with more comfort. At the rear side of this model, the lights are placed lower and the fuel filler cap position has also been changed from its sibling. The stop lamps feature LED bulbs.